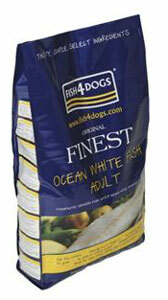 The Fish4Dogs range originated as a bi-product of the bulk buying of fish for human consumption - using up the remains of the fish carcase after the fillets were removed for supermarket sales. This has a positive point in that it ensures that there is less waste, particularly as fish is such a good source of good quality protein and oils. The food now is sourced within Norweigan waters, using farmed fish, and it is here that it is manufactured. 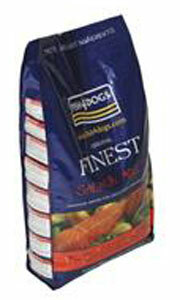 Fish oils are rich in Omega 3 fatty acids which can aid in the maintenance of good coat and skin condition. Many other foods add this to their recipes, but using fish as the main source of protein means that the oil is there naturally. Salmon and white fish farmed in Norwegian waters together with potato and pea flour to contribute to the starch and carbohydrate content, and less likely to cause problems with sensitivity than some cereals. A 12kg bag is going to cost around £53 which is not cheap, there are natural foods at £30+, so you really do have to want a quality fish-based food!